A recent spark has ignited conversations in the sports world thanks to the announcement on Tuesday that the National Hockey League (NHL) is bringing an NHL expansion team to Seattle for the start of the 2021-22 season. Hockey fans in Metro Vancouver and Seattle alike are keen on the idea, and a potential rivalry is likely to be formed between these two neighbours according to the latest poll by Insights West. The online survey of a representative sample of 819 residents from British Columbia and 463 from Washington State, finds strong agreement among hockey fans in Metro Vancouver (89%) and Seattle (88%) that a team in Seattle will create an exciting rivalry with the Vancouver Canucks. Moreover, this rivalry could lead to a nice boost to the tourism industry of both regions, as the majority of these fans (56% in Metro Vancouver and 55% in Seattle) say they’re willing to travel to each other’s city in order to watch a game. Despite agreement over how exciting an NHL rivalry between the two cities would be, less than two-in-five British Columbians (37%) consider themselves to be personally excited about the possibility of an NHL franchise in Seattle. This is in stark contrast to the palpable excitement across Washington State, where 60% of residents—including 88% of those in the Seattle area that follow hockey—would welcome a local NHL team. There is also state-wide agreement (71%) that the Seattle area is overdue for another professional sports team and a high level of optimism that the city will be able to overcome the challenges that led to the Sonics basketball team moving — two-thirds of residents (66%) feel optimistic in this regard. A large proportion of hockey fans in Washington (68%) are even confident that the Seattle team will be able to replicate the success of the Vegas Golden Knights, while hockey fans in BC (21%) are significantly more skeptical about whether they will be able to accomplish this feat. 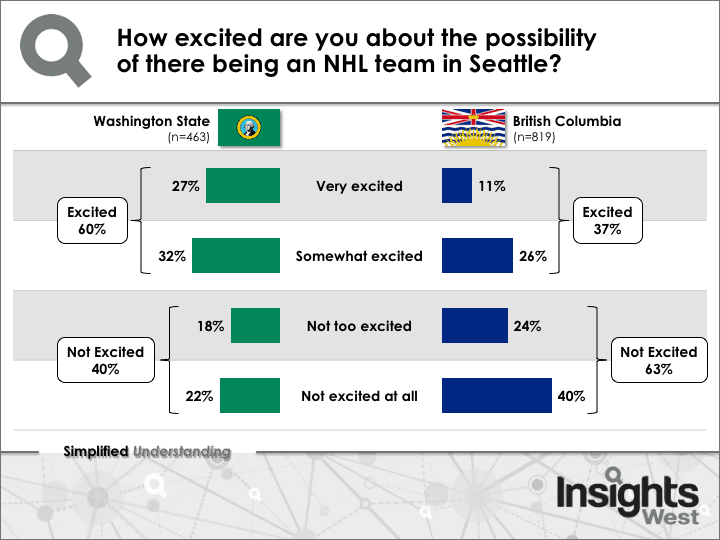 Although the majority of residents in both BC and Washington are aware of the possible NHL expansion to Seattle (57% and 54%, respectively), awareness is much higher among non-hockey fans in the Seattle metropolitan area (53%) than their Metro Vancouver counterparts (19%). Levels of awareness are much more comparable among those that follow hockey in these two cities (78% awareness in the Seattle area vs. 71% in Metro Vancouver). When BC hockey fans were asked a series of questions on how they perceive NHL expansions, three-in-five (62%) agree that expansions are an important way of ensuring the long-term success of the league. However, there is a small segment of this group (39%) that believe expansion dilutes the quality of play and reduces the odds of the Canucks winning the Stanley Cup (41%). BC hockey fans are more closely split on whether the Canucks have been at a disadvantage by not having another NHL team nearby (46% agree that they have been disadvantaged, 43% disagree). 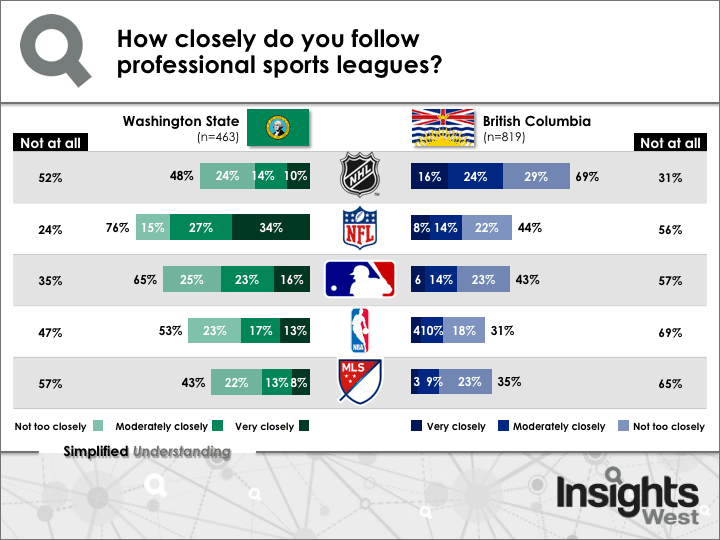 For the most part, those in Washington State are more likely to follow professional sports leagues than those in BC. 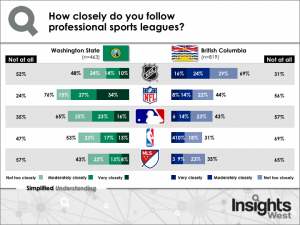 At least half of Washington’s residents follow the NFL (76% compared to 44% in BC), MLB (65% vs. 43% in BC), or the NBA (53% vs. 31% in BC), while fewer follow MLS (43% vs. 35% in BC). This, however, is not the case with the NHL, where seven-in-10 British Columbians (69%) follow professional hockey compared to 48% of those in Washington. Results are based an online study conducted from November 16-19 among a representative sample of 819 adult British Columbians and from an online study conducted from November 23-27 among a representative sample of 463 adults from Washington State. The margin of error is +/- 3.42 percentage points in BC and +/- 4.55 percentage points in Washington State.